On November 4, China’s Ministry of Industry and Information (MII) assigned TDD-LTE licenses to all three cellular operators: China Mobile, China Telecom, and China Unicom. The move is good for China, Apple, and a handful of other handset and chip makers. The licenses are a step toward China’s long-term effort to unify nationwide cellular operations. Until now, each of the three operators employed different air interface technologies. China Mobile, with the largest network, has a GSM/GPRS 2G heritage, with the more recent addition of 3G TD-SCDMA technology. China Unicom also has a GSM/GPRS heritage, but with WCDMA as their 3G upgrade path. China Telecom, though, seemed to be an outsider, as the only carrier employing CDMA technology, but more recently also employing TD-SCDMA. It should be noted that TD-SCDMA technology is said to have been developed in China as a way around licensing Qualcomm’s CDMA technology required for 3G WCDMA. Its market was slow to take off, but shipments this year will grow almost 100% because of the earlier MII mandate for its implementation. However, I project that future TD-SCDMA investments will decline because of LTE. The new license assignments were not a surprise, since all three operators have been trialing LTE networks in several China cities for many months. China Mobile has adopted TD-LTE (the China-developed version of TDD LTE), while China Unicom and China Telecom have adopted FDD LTE as their main 4G standard and TD-LTE as an auxiliary to conform with the China government’s policy of promoting TD-LTE. Note that the three operators have different frequency band assignments, so they can overlap geographically. The first three TD-LTE modem chip suppliers qualified by China Mobile were HiSilicon, Qualcomm, and Marvell soon to be followed by Spreadtrum and Nvidia. Last week, Marvell announced that its PXA1802 modem platform will be in Yulong Coolpad’s 8736 LTE/TD-SCDMA smartphone that has been certified by China Mobile. According to two sources, in the first quarter of 2013 Coolpad displaced Apple and Huawei to become the third largest cellphone supplier in China, following Samsung and Lenovo. China Mobile has already extensively upgraded its network in anticipation of the TDD license and China Telecom plans to begin LTE service before April. The biggest cellphone beneficiary of the LTE rollout will be Apple. The two smaller networks have been selling Apple handsets for some time, but not giant China Mobile with its 760 million subscribers. That’s because there have been no iPhones capable of TD-SCDMA. LTE iPhones will be readily available when China Mobile turns up its new service early in 2014. According to Taiwan-based suppliers, China Mobile is likely to procure 40 million TD-LTE smartphones and 10 million TD-LTE data terminal devices next year. Of course, iPhones will also be in that smartphone count. 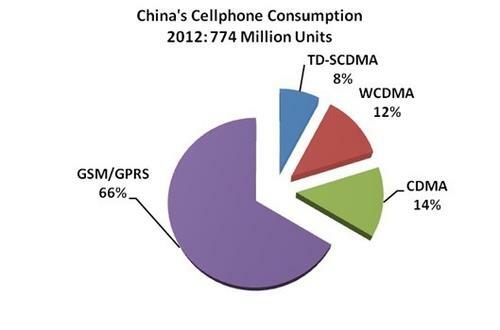 China is the world’s largest market for cellphones with 23% of all units compared to 11% for North America. All in all, rollout of LTE networks in China will move at a rapid pace in 2014, contributing to the growth and continuing excitement of the cellular chip market. — Will Strauss is Principal of market watcher Forward Concepts in Tempe, Ariz.